A Classic Example of the Strong, Silent Type. It’s quiet the ride. 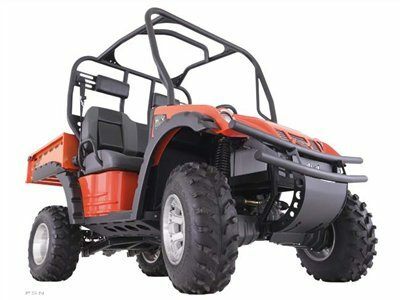 Our AC-powered brushless electric motor runs cooler, produces more torque, extends battery life and gives the utility vehicle a smooth ride and strong work ethic. This is no golf cart on steroids - it’s a steel-framed, purpose-built from the ground up 4WD UTV with the most advanced motor and controller in the industry. Our independent articulating rear suspension system with solid rear axle provides traction for climbing the toughest terrain and hauling the largest loads. It’s so powerful that when hooked back-to-back, and the pedals are floored, it’ll drag a gas side-by-side with triple the horsepower right out of its ruts. So even if you’ve driven other electrics before, you’ve never driven an electric like this. We’re charging ahead in a world of UTV’s and the only thing loud about this rig is the noise it’s making in the industry.